Gayndah Museum - giving you a glimpse of a way of life now gone. The Gayndah Museum operated by the Gayndah and District Historical Society Inc. is housed in what was the very first brick house built in Gayndah and our displays let you see what family life was like in rural Queensland during the second half of the 19th Century. 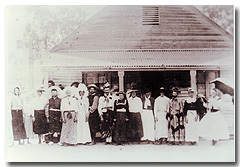 We also have an extensive collection of photographs taken during the early days of Gayndah and they provide a chance to look at the way the township functioned and the people interacted with one another. Many of the photos in our collection depict life on the land when much of the hard work was done by men and horses. These rare fresh water fish are survivors from prehistoric times and our Lung Fish display has been recommended as the best display in Queensland. Not only do we have an interpretive display but we also have two live lung fish for you to see. The Museum also boasts a fine collection of various vintage vehicles, tractors, steam engines and other equipment ranging from rare trucks and tractors through to stationery steam engines from mills and even warships. Many are in operating condition and the Gayndah Museum holds regular steam days throughout the year. 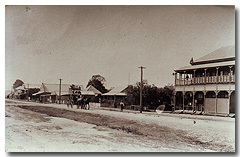 Let us bring rural Queensland history to life for you!